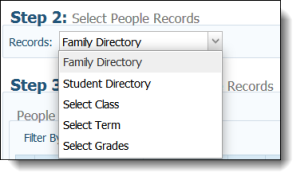 From the (Step 2:) Select People Records list, select the source you want to use for selecting students. Use the filter fields (highlighted in yellow in the screenshot below) to narrow down the search. These include the Last Name and the Filter By Age fields. If you leave all filter fields blank, it may take a very long time to generate the list of names from which you will select your students. You will see the added students under the New Students section on the right side of the screen.C If you made a mistake, you may remove them by clicking the red negative sign to the left of their name. Once you are done populating the New Students list, click the Add Students button at the bottom of the screen.